2016 was another record year for investments of VR companies. This in-depth analyst report quantifies the most important venture funding trends. 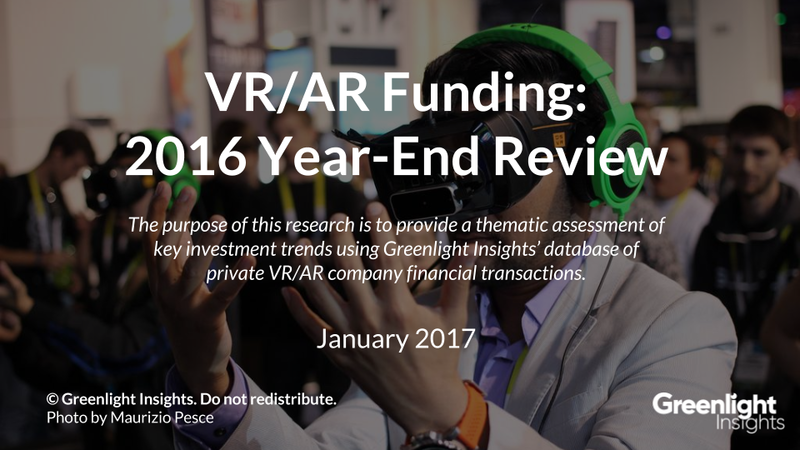 With 2015 breaking previous records, we entered 2016 wondering if VR/AR funding would be able to keep pace. To our pleasant surprise, VR/AR saw $1.8B in total venture funding, ending the year significantly above the 2015 mark. While skeptics may question the attractiveness of VR and AR as an industry, it’s important to keep in perspective the fact that the space is still immature, with most deals being Seed or Series A funding rounds when many sub-sectors proving to be very high-growth. Plus, subscribers receive PDF copies of reports covering industry trends, access to Global Forecast Service and Venture Funding Database, and full-access to our senior analysts for one year.